With the aroma of vape wafting through the air paired with the unmis­takable sight of faux palm trees lighting up the shop, Hillsdale’s very own Vape-n-Chill not only pro­vides vape to its cus­tomers, but builds com­munity among locals as well. According to its unwritten but well-under­stood mission statement, Vape-n-Chill’s goal is to wean people off nicotine while getting to know them on a per­sonal level. Vape-n-Chill, which opened a little over a year ago on W. Car­leton Road selling Goose Juice, encourages people of all ages to stop by for a vape and for some con­ver­sation. The shop boasts a friendly lounge area of two couches, a booth, a chair, and not one but two faux palm trees. After working at Mr. Darcy’s, a former Hillsdale vape shop, for over 10 years, Paul Taylor was ready for a change. After dis­solving his part­nership at Mr. Darcy’s, Taylor part­nered with Nick Gallup, as part-owners, forming Vape-n-Chill. Taylor and Gallup are both co-owners, with Taylor as a silent partner and Gallup as the only in-store employee. Gallup said they were able to bring the estab­lished cus­tomer base from Mr. Darcy’s to Vape-n-Chill. One cus­tomer, Alvie Sackett, said that after shopping at Mr. Darcy’s for a few years, it just made sense to start going to Vape-n-Chill. “I live nearby so that made it real con­ve­nient to come here,” Sackett said. Despite what may seem like a strategic location near a college, Gallup describes their demo­graphic as anyone from ages 18 – 60, claiming there really isn’t any small, target audience for vaping. Gallup said most cus­tomers are former smokers who are using vaping not only as a hobby but as a way to get off nicotine. For this reason, Vape-n-Chill doesn’t carry any pods or devices such as Juuls. 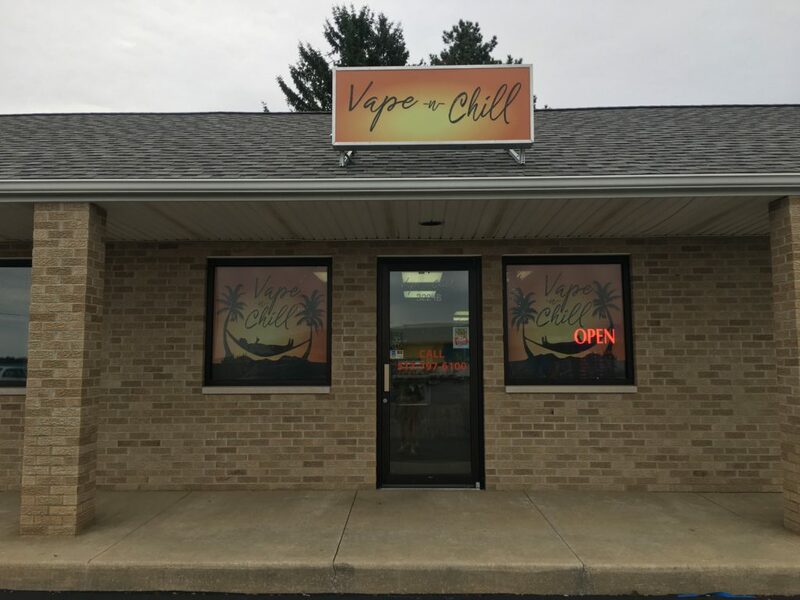 What sets apart Vape-n-Chill from other com­petitors in Hillsdale is its spe­cial­ization in just vaping as opposed to a variety of smoking, as pro­vided by a big com­petitor, Wild Bill’s. One Hillsdale College junior said that she prefers Smokey Joes, another vape shop in town, because of the wide variety. These other types of smoking, Gallup said, only further people’s addic­tions. “I want it to be a safe envi­ronment for people to come and vape and talk to others who are going through the same thing,” he said. Gallup empha­sized fos­tering com­munity as a big part of his role in the company. His job description con­sists of the usual things: checking inventory, placing orders for more vape, and cleaning the glass which he said gets atro­ciously dirty due to the con­stant flow of vapor. There have been no major issues and business is going well despite lack of major adver­tising Gallup said. He attributes their success in their first year of business to the loyalty of their old cus­tomers and great word-of-mouth adver­tising. According to Gallup, Vape-n-Chill has no plans on changing a thing. He will con­sider pos­sible future expansion but, for now, every­thing is going smoothly. “I can see myself staying here for a long time,” he said. Vape? This is what they used to call a opium den, right?